Customer engagement. It’s a simple pairing of words that can mean so much to so many organizations, both large and small. When it comes to 1:1 engagement and gaining real insights from customers, there are a lot of great tools out there. However, few are as value-adding and easy to use as PowerObjects’ PowerPack Add-Ons, specifically PowerSurveyPlus. 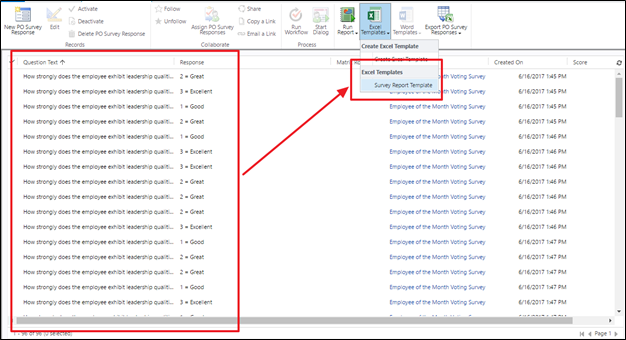 If you’re unfamiliar, PowerSurveyPlus is a Dynamics 365 add-on that allows users to very quickly and very easily build and distribute polished, robust surveys that pull response data right into Dynamics 365. This allows for insights at a customer level, as well as the ability to report on broader data sets that highlight trends, ratings, verbose information, and more. Because of the data structure in Dynamics 365 with respect to parent/child (or 1:N) record relationships (especially if there’s a more robust data hierarchy at hand), sometimes visual reporting and analytics requires a little more by way of configuration or maybe even custom reports that tools like SSRS can provide. That said, with the advent of Excel Templates in Dynamics 365, reporting on slightly more complex data has never been as easy or as elegant. As a unique use case, we’ll take a look at engagement with internal customers; that is, using PowerSurveyPlus to surface outstanding employees for an organization (as opposed to direct consumers/external customers). For more detailed, step-by-step information on how to design surveys, jump to our PowerSurveyPlus user guide. For the substance of our survey, we’re asking four straightforward questions with standardized, uniform responses as radio button types. This uniformity is important for how we’ll query and report on that data within an Excel Template, as we can aggregate the uniform data in like groups. 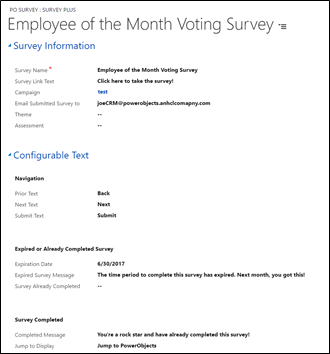 Once we have our survey built and distributed, we’ll start to see responses roll into Dynamics 365 as PO Survey Responses. We can build dashboards or lean on the out-of-the-box report wizard to generate what we need, but there are several reasons users may want to go down the Excel Templates route: non-Dynamics 365 users who need to work with/digest the data easily, advanced analytics and slicing/dicing capabilities, enhanced chart customizations and customizability, and team-based collaboration or data work that needs to exist outside of Dynamics 365, to name a few. 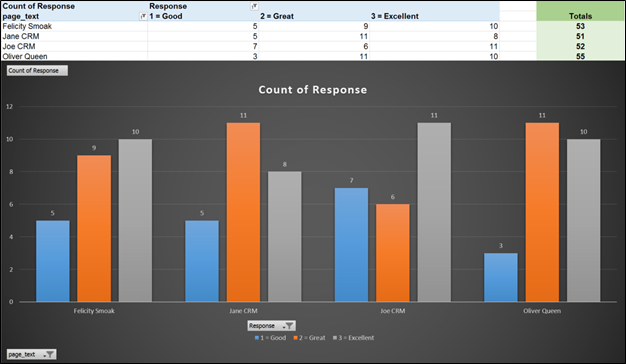 For our purposes, we’ll want to generate an Excel Template for PO Survey Responses record type. As described here, you can generate Excel Templates in two ways. A numeric counts and sums by employee table. A PivotChart that visualizes that table data. Note: If you’ve never worked with Excel PivotTables and PivotCharts before, it will be helpful to do a little digging before moving through the following steps. page_text: this is how we’re isolating our employees, as they each have their own page in the designed survey. This will act as our main category within the PivotChart. Response: this will be what we tally, so we’re setting this as our series metric. Count of Response: this is included in the summation of values in the PivotChart matrix as that’s the data we’re compiling and reporting on at the end of the day. Note: the template we just created can be used against any data set for that respective entity in Dynamics 365. That, and it’s a best practice to make sure the data refreshes automatically upon creating future exports from this template, so you’ll want to make sure to select ‘Refresh data when opening the file’ under the Data tab in the PivotChart options (accessible by right-clicking the chart). Upload your template back into Dynamics 365 and you’ll be able to use it to report on PO Survey Response data! We’ll want to isolate the data to just the responses from our survey, not any others that will muddy the reporting waters. To do this, Advanced Find comes in handy to query against related entities and drill down into exactly the data set we need. To properly silo the data we need, we can work between three layers of parent/child data: the survey record itself, the distributed survey activities (the ‘instance’ of the survey), and the associated survey responses. What’s nice about PO Survey Response records (the records we need to analyze) is that while they’re further down the data hierarchy, they carry a direct N:1 relationship against the top-level survey record. Note: Based on the results, it seems like the leader of Queen Consolidated might have had some help in winning this thing…maybe another round of surveying is in order to find the true victor. Valentine’s Day has us feeling all in love . . . . with Dynamics 365 of course! For today’s installment of The CRM Minute, check out a few of our favorite onscreen dynamic duos in these episodes featuring double the CRM power for double the entertainment. 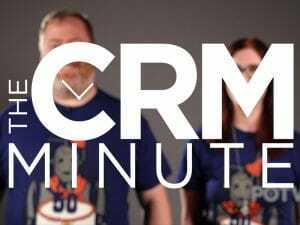 The CRM Minute: Paging Doctor Who, CRM is Calling! That’s all for the blog today! Remember to subscribe to PO TV so that you don’t miss a minute of the action. And if you want to experience even more CRM video content, join us for our first ever LIVE video webcast, The Beginners Guide to PowerApps. This premier broadcast event features our Office 365 Support Engineer in a face-to-face, interactive webinar where he’ll dive into PowerApps in more detail and demonstrate how it all comes together. REGISTER NOW! Blame House of Cards. The Netflix-produced hit was the result of an algorithm coupled with Netflix’s large collection of data on what viewers like to watch. Taking that as inspiration, ad agency McCann Erickson recently added the world’s first artificial intelligence (AI)-based creative director to its team in Japan. The memorably named AI-CD β will use data on award-winning commercials to produce ideas for new campaigns. The company isn’t the first to let the math do the thinking: In 2014, Hong Kong–based venture capital firm Deep Knowledge Ventures announced a new addition to its board of directors, VITAL, which uses data to vote on potential investments. More recently, Finnish tech company Tieto welcomed Alicia T., an AI complete with a conversational interface, to the board (a win for board diversity?) of its new data-driven business services unit. For all the fears of AI taking all our jobs, the reality will likely be less dramatic. Outside of repetitive work that requires no independent thought, AI-human collaboration, rather than outright replacement, is the future of work. Jobs will be shared, with some tasks delegated to AI and monitored, to some extent, by humans. According to McKinsey & Co., 60% of jobs could see 30% or higher automation of some tasks. But there will need to be big technological and cultural shifts to make AI as common as your laptop. The corporate structure as we know it could disappear as conventional hierarchies are replaced by new models with different emphases and values. Meanwhile, the skills that executives and employees need to bring to an enterprise will change. Creativity and problem solving will become the highest-valued human abilities. Better start preparing your organization now. When Oxford Martin School and Citi GPS released the 2015 report Technology at Work, one particular number garnered a lot of attention—and more than a bit of panic. According to the report’s authors, about 47% of U.S. jobs were at high risk from computerization (19% were at medium risk, and 33% at low risk). Augmentation isn’t a new philosophy. Engineer and inventor Douglas Engelbert—who created the first computer mouse in 1964—was one of the early tech pioneers who believed that technology would work alongside humans. His idea was that the true purpose of technology was to augment and amplify human capabilities, not completely replace human labor. Indeed, most jobs have both repetitive and consistent tasks and intellectual and decision-making elements, says Sam Ransbotham, associate professor of information systems at the Carroll School of Management at Boston College. The question, he says, is how things will be divvied up between the humans and the machines. Just don’t expect it to be an all-or-nothing landscape. Thomas H. Davenport, President’s Distinguished Professor of information technology and management at Babson College and co-author (with Julia Kirby) of Only Humans Need Apply: Winners and Losers in the Age of Smart Machines, thinks that delineation of automation in knowledge-based work will operate at the decision-making level. Highly repetitive decisions that are backed up with significant data will be relegated to AI. But even then a human role remains. Labor will be divided along the lines of what AI can and can’t do; creativity, abstract concepts, and many other human qualities are not AI capabilities, for example. It’s still a challenge to create AI that can truly replicate the kinds of human abilities we take for granted, and many of the decisions that managers and executives make on a daily basis don’t easily fit into the AI paradigm. The complexity of human relationships, minds, and cultures are currently beyond AI’s grasp, and this extends into the workplace. The algorithmically defined “right” decision might not necessarily be the best political and social decision. The role of AI in these instances could be to clarify and winnow options and to help identify opportunities. Organizations will need to parse decision making not just in terms of its value but also according to its uniquely human elements. Much of a typical workday for many involves mechanical tasks that are often mistakenly thought of as creative and unique. They could potentially be farmed out to an AI bot (think of never needing to write a generic e-mail ever again, and rejoice). With those time-consuming tasks out of the way, there would be more time to focus on truly valuable pursuits, like determining on an empathetic level what customers really want and tapping into their aspirations. The changes that AI collaboration engenders could go beyond the task or employee level to challenge the entire way we think about how companies are organized. Most companies are currently organized like machines, with discrete elements, each focused on its own purview. But AI could usher in a new style of corporate organization. Companies will become more connected and less siloed and hierarchical; they’ll operate in a more organic, flexible manner. These connected companies will be able to synthesize and distill inputs quickly and constantly. Instead of defining work by a fixed department or business unit, they will define it by projects and purpose. This could change the manager–employee relationship as well. The dynamic nature of a connected organizational structure places less emphasis on seniority and more on ideas, so a junior employee’s good idea is more likely to be given weight. The power of the HiPPO—highest-paid person’s opinion—could be on the wane. Good design creates a symbiotic relationship with technology. If the purpose of AI technology is to amplify human capabilities, then it must be crafted to have a giving personality to create an optimal experience for humans, with minimal frustration and maximum efficiency. For example, AI programs could be designed to offer suggestions based on context, similar to those that Amazon provides to consumers as they shop on its site. AI could suggest apps based on what people in similar positions use, recommend collaborations and networks, research sources, and even intervene to help human colleagues when appropriate. Roles will change as AI becomes a ubiquitous presence in the workplace. Where will your employees fit in? Step up: Oversee automation within an organization and ensure it’s a good fit with the business and the larger world. Step aside: Leverage creative, innovative human skills and emotions. Step in: Keep AI on track by supervising its processes and results and making necessary adjustments. Step narrowly: Perform highly specialized work that wouldn’t be economical to automate. Step forward: Create the next-generation AI technology. Stepping in, says Davenport, is the role with a high level of interaction with a machine, “almost as a colleague.” Many employees will likely transition to that role, but there will also be new roles that involve monitoring and improving AI performance. For example, stepping up is a managerial role that encompasses high-level decisions and resource management, akin to a portfolio manager. “As we have fewer people in organizations doing the day-to-day work, I think it will certainly be a more important part of the managerial role than it is today,” he says. What we’re looking at is a fundamental shift in mindset, says James Cham, partner at San Francisco–based venture capital firm Bloomberg Beta. Traditional software has been focused on precision and efficiency, he says, whereas AI is predictive. “Records of predictions, which capture what I’m thinking, calculate whether those predictions are right or wrong, and help to inform those predictions, will actually be of much higher value,” he says. The amount of time we spend each day looking for answers will be minimized because AI will have the information. Asking the right questions, however, will become much more important. The executive of the near future will be trained to think creatively, a shift from the traditional emphasis on procedural knowledge to one of unstructured problem solving with AI as a patient, indefatigable research assistant. In a bid to supply the next crop of executives with the tools to work with AI, some of the top business schools, including Harvard Business School and MIT’s Sloan School of Management, have recently begun offering courses on AI collaboration as part of their MBA programs. The goal is not only to educate students on AI in general but also to teach them how to use it as a decision-making tool. One class will include how AI can be used to create optimal teams. Transparency should be part of an AI system’s design. A system can, for example, be programmed to offer a rationale for its thinking that allows a human to dig down through layers of information. This might be delivered through a report or even a voice system. So if an employee asks an AI system why it did what it did, the system will answer. Machine-learning models should not be black boxes; instead, they should be able to explain the confidence rate in the results, the error rates, and why the model is predicting or proposing certain things, so that people can follow up and double-check. How AI-enabled tools are integrated into employees’ work is also important. It all comes down to trust. New AI colleagues should be introduced just as new human team members would be. Start by giving them small, easy tasks and then gradually give them bigger, more important jobs. That’s how trust is gained in the workplace, and it shouldn’t be any different for AI collaboration tools. Though some organizations may decide to allow AI to operate independently, building in the flexibility so that users can adjust or override their AI tools helps maintain a sense of purpose and control. It also helps if organizations explain employees’ future options and give them a sense of what new skills they may need. “It’s going to take some time, I think, to prepare, so you need to tell people about it,” says Davenport. But generational changes might make AI acceptance easier in a more organic fashion. Millennials will soon be a significant force in the workplace, and they have grown up with technology. Their acceptance of it is stronger, and they take its presence in the workplace for granted. Using AI tools will be no different for them. But before any of these big cultural shifts happen, enterprises must think about how they will deploy this technology. Many still think of AI only in terms of labor replacement or as a magical cure-all for business problems. “I think, in general, that kind of coarse-grained thinking is not helpful, and it is actually not accurate,” Cham says. Feasibility is another important factor in implementing AI in the workplace. Just because automation is possible does not mean it is practical or cost effective. In some cases, human labor will remain less expensive and more effective for at least the foreseeable future. Indeed, Cham thinks that a lot of money will be wasted on misguided AI investments. “Even after you solve the technical problems, we have a bigger problem, which is we don’t have good economic frameworks for determining when AI makes sense,” he says. “We need better intuitions around where can you get a better bang for the buck. What does AI complement, and what does it replace? I think that sort of thinking is what we really, really need now,” he says. The impact of AI on the workplace is going to be enormous. We’re just starting to experience the current real-world applications of AI and understanding how they’ll develop in the future. Now is the time to begin formulating a plan for AI’s implementation in the workplace and to prepare and train employees for what’s ahead. Think of how to redesign processes to create the best combination of human and AI abilities, says Cham. “It’s a question of what you focus on and what kind of teams and infrastructure you build to actually make more effective decisions and run better processes.” D! Dinesh Sharma is entrepreneur-in-residence at SAP.io. Erik Marcade is Vice President of Advanced Analytics, Products and Innovation, at SAP. Chandran Saravana is Senior Director, Advanced Analytics, at SAP. Danielle Beurteaux writes about technology and business. 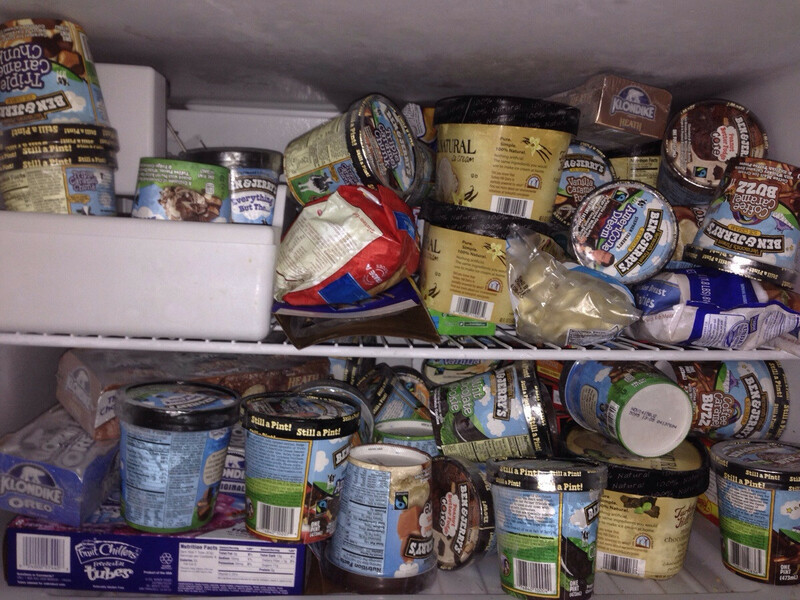 Ice cream lover’s delight to open the freezer and see it well stocked.